Having grown up in Jaipur the only parathas I knew of, were the savoury style aaloo and pyaaz parathas. Only when I lived in Pune during my journalism course that I tried the sweet variant and instantly fell in love with them. Though traditionally Puran Poli dough is kneaded with warm milk and jaggery is added to the cooked chana dal, I have simplified my recipe – its quick and easy! Once done, remove from the tava and apply more ghee….and…. 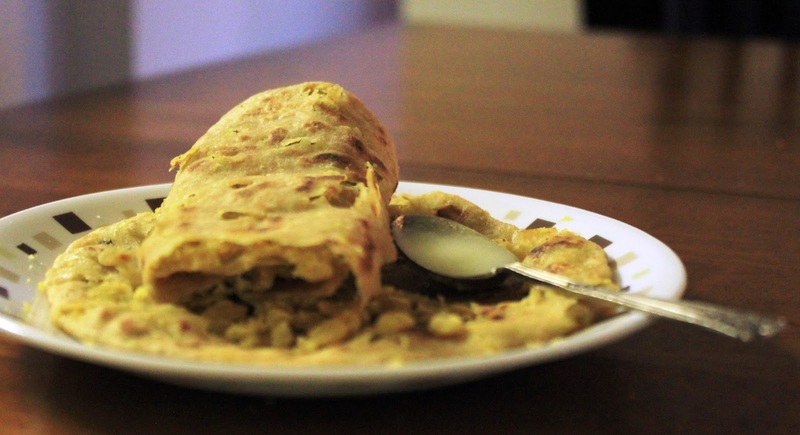 revel in the taste of this delish paratha! First, please put a recipe to knead flour in a food processor….second, cook daal means in a cooker or boil? You could knead the flour in the food processor using these proportions: 3 cups flour, a tsp salt ( optional) and about 10-12 ounce (350 ml) water. Put the flour in food processor, use plastic blade, put lid on and add little water gradually while the food processor is on…till you get the dough of the softness you like. Pressure cook dal on high heat upto one whistle, lower the heat and cook for 15-20 mins or until soft.